Best Heating & Cooling proudly serves Sandy, Utah with fast, dependable heating & air conditioning service, repair and installation. We have been serving Sandy and the SLC area for over 12 years and our HVAC technicians have the experience and training to correctly diagnose and repair you heating & air conditioning problems. We carry a large selection of quality HVAC equipment and our heating & air conditioning installation professionals will make sure your new air conditioner, furnace, or heat pump installation will go smoothly. From the coldest days of winter to the hottest days of summer, Best Heating & Cooling has you covered. We are the HVAC contractor Sandy, Utah residents can count on for quality heating & air conditioning service. Our skilled HVAC professionals have the ability to service and repair all makes and models of furnaces, air conditioners, heat pumps, ductless mini splits and home heating and cooling systems. From sudden HVAC system breakdowns to routine maintenance and new installations, we are ready to help with all of your heating and cooling needs. 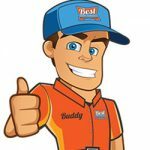 For all of your heating & AC repair, service and installation needs, contact Best Heating & Cooling when you need a professional heating & air conditioning contractor in Sandy, Utah.